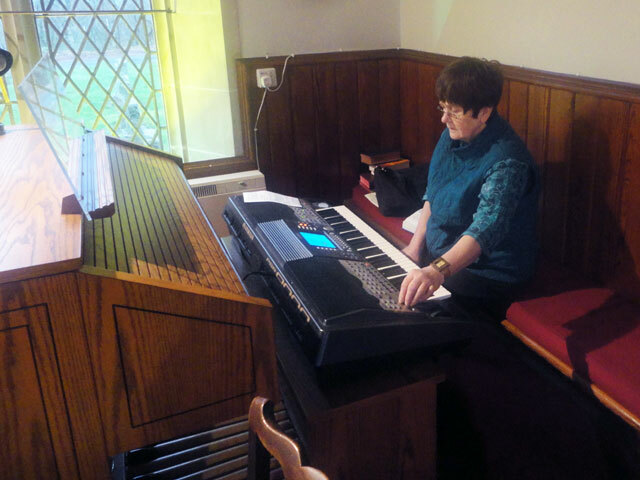 It is Sunday and we have to be at Church earlier than usual because Rachel is providing the music for the service (to allow Gay to welcome her brother home from Australia). Mix and I walk in the pouring rain before it is quite light – there didn’t seem to be a dawn this morning, it just went from dark to a little bit lighter. There was no sun appearing over the horizon; there was no dramatic lightening of the sky; no colour, no heavenly excitement. And as we walked, Mix kept turning and looking up to me as much as to say, ‘I’m only doing this to humour you. Back home I showered and changed and breakfasted and by 9.20 a.m. we were on the road to Gavinton where Rachel provided the music (and it sounded very good indeed). Today was homelessness Sunday and Ann spoke quite passionately about the plight of those who were homeless and of those who were trapped in poverty, particularly highlighting the fact that so many of the most prosperous areas of our cities lie cheek-by-jowl with areas of severe poverty. From reading in Isaiah about ’the people who lived in darkness have seen a great light’ she moved to Matthew’s Gospel where the verse is picked up and referred to Jesus shortly before he started to gather his disciples. Together they set out to change the world. That task is as necessary today and the challenge remains for us – and, Ann reminded us, using Paul’s first letter to the Church at Corinth as her authority, that we are called to devote our lives to the important things (too often, she confided in an aside, it is the less important things which capture our attention). Appropriately, the money gathered at the morning coffee after Church went to help those working with homeless people in our country. We returned home and shared in a communal lunch in the farmhouse (great, as usual – a fishcake starter followed by sausages with Yorkshire puddings, roast potatoes, parsnips, carrots and turnip: full of goodness and filling as well). Conditions were not ideal but it was certainly a lot better than this morning. 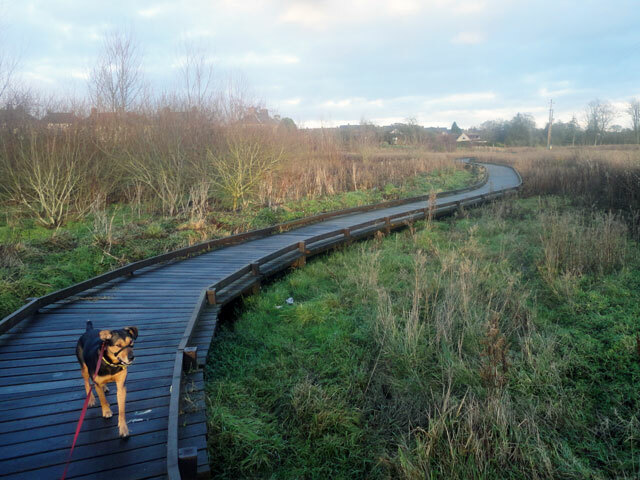 Mix enjoyed his trip this time, although it was cold and damp and very wet underfoot (hence my appreciation of the extended areas of boardwalk). 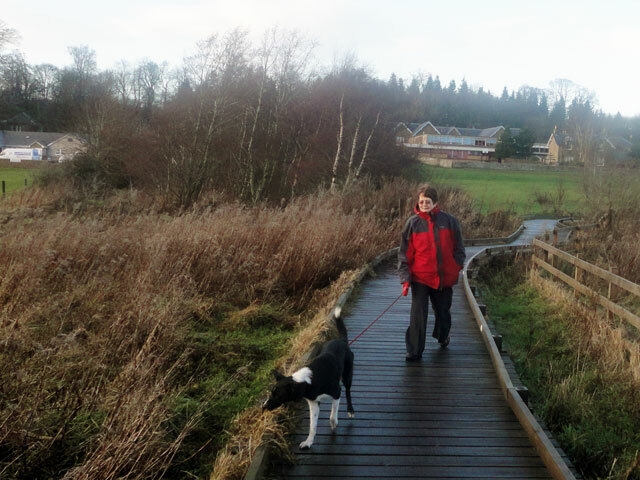 Rowan also enjoyed her walk although she wasn’t at her most obedient and Rachel had her hands full! Back in the Granary we loaded all of our Christmas decorations into the small attic above the master bedroom and I continued with the task of washing all my clothes. Unfortunately the power of the spin-dryer dislodged a bottle which smashed. Rachel and I cleared up and wiped up and were happy that it was only a relatively cheap bottle of white wine and not the ten-year-old whisky bottle which had been sitting next to it. Mix and I spent a little while in the summer house (Mix loves his giant cushion and would happily spend all day here). Then it was back to the Granary to light the stove and spend a relaxing evening – sparing a thought for Olive who had to travel up to Edinburgh to stay with her son Jeffrey so that she can get to Dundee early in the morning to deliver a lecture. Never mind, she finishes in April and we are all looking forward to that. Our relaxing evening was just that – fabulous. No thought of work to come; no work to come. Just our own adventures and while these involve toil they are the greatest fun imaginable. We dined on antipasto followed by blue cheese and then we enjoyed the froth of Mr. Selfridge and the exciting denouement of The Tunnel. The final episode lived up to the standard set by the previous nine episodes and I was left feeling that it had been properly rounded off and that the cinematic journey had been thoroughly worthwhile. It was also very exciting. By the time we had got to the end of our watching, the wind had blown up quite alarmingly and we were blown around the policies with the dogs. It was good to get to bed with a thoroughly good week ahead of us. On Thursday evening we are to go to see Coriolanus (the last time I was involved I was a member of his army in a production in Saint Andrews Castle some forty-six years ago). The rest of the week we shall be working on our projects – the top floor of the hen house to clean out, Mum’s morning room to take forward, more boxes of books to find and then unpack and, eventually, the stables to empty and then repack. Of course, we still have the shingles to put on the roof of the summer house and some treatment to carry out. Lots of toil but no work at all. How fortunate we are and what a good day today has been.